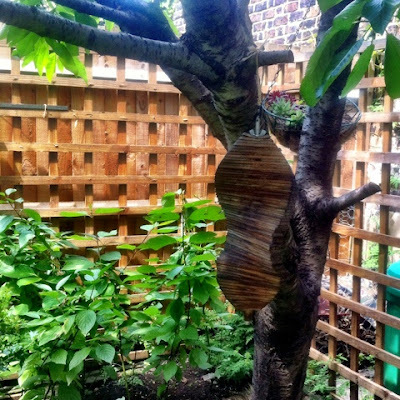 But anyway, last week I hung it in the garden on our Laburnum tree. Although MOH had bought some chain to hang it with in the end I used some red ribbon - mainly because I couldn't work out how to attach the chain and because I wanted it around one of the branches, so it hung correctly. It'll need to come down for the winter so there'll be another opportunity to work out how to attach the chain next spring! Here it is zoomed out a bit. And no, we don't have a pool! 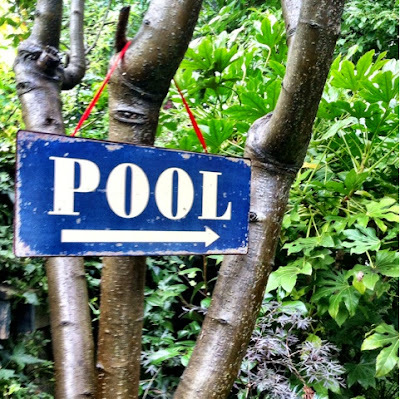 But if we ever got one, I've already got the sign... Just as I finished hanging the sign the weather had a go at providing a natural pool with a mahoosive storm, so my lovely new sign has already survived it's first downpour. 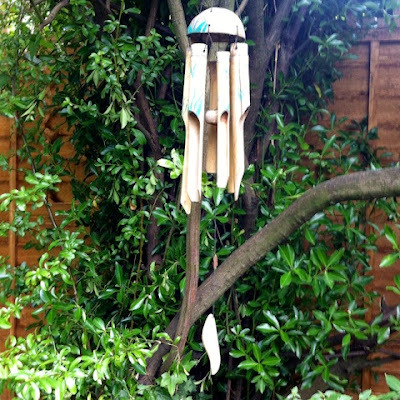 Hanging my latest garden ornament got me to thinking about what else we have in our garden, so I thought I'd share some of those too. Here's a wooden whirly thing (technical term) which I bought in Cairns, Australia back in the late 90s - it's mesmerising to sit and watch it whirl! 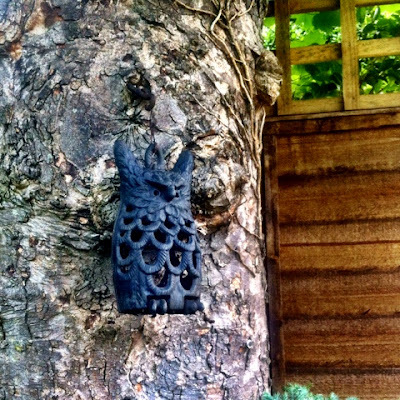 Then there's the cast iron owl who's been hung from one of our large sycamore trees near the patio. He holds a tea light and while he looks quite grumpy about it he casts a nice glow when he's lit. 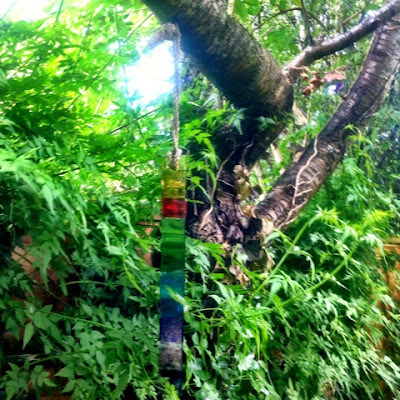 This is our rainbow glass hanging which we bought in Padstow, Cornwall in a shop that wasn't owned by Rick Stein! He's everywhere in Padstow and we stayed in his B&B - very nice it was too, but it did become a bit of a challenge for us to bring something non-Rick back with us! 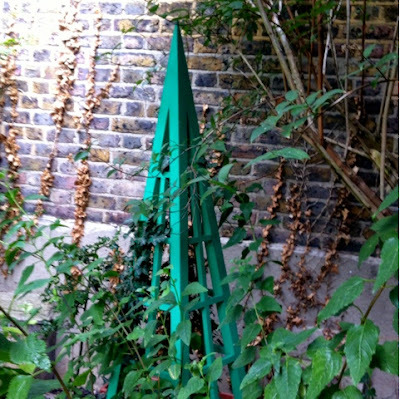 Ah the obelisk. 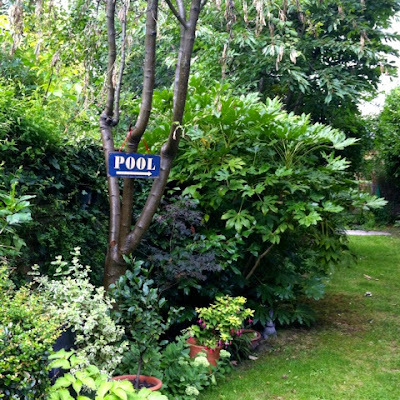 This is at the end of our garden and provides a focal point from the house. I had the winning bid in a charity auction at work, much to MOH's dismay. It's about 5 foot tall and made of wood and not something MOH was prepared to carry home on the train, so we drove up to the City to collect it one weekend. 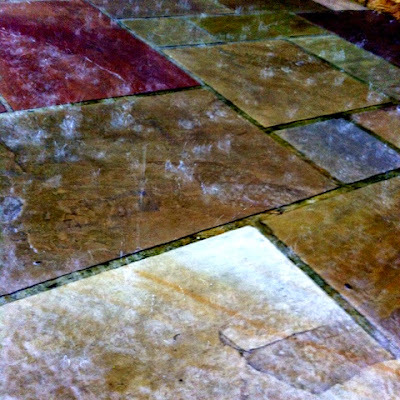 It was that colour when I bought it and it stays out in all weather and has lasted remarkably well! 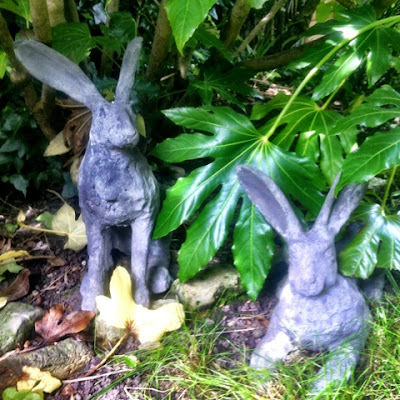 These are our concrete hares - Hartley and Devon, of course we named them. We saw these at an exhibition at Greenacres in Devon, which was Agatha Christie's house and is now a National Trust property. Being us, we didn't buy them at the time and then regretted it. So onto the internet I went to find out who made them and to order a couple. I managed that ok and then arranged for them to be delivered to MOH's aunt's house in Devon, where my in-laws collected them when they visited and we collected them from them! Actually even if we'd bought them when we were there, we'd travelled to Devon by train so lugging two concrete hares back into and across London probably wouldn't have happened. And if you're wondering about the names - of course you'd call your hare Hartley wouldn't you?! Well you would if you grew up in the 1970s and watched Pipkins. Our wind chimes came all the way from Maui, Hawaii which we visited for a wedding and we had no trouble getting this one in our case, although it did have a stop over in Las Vegas on the way back. The last of my ornaments that I'm sharing needs a bit of work. 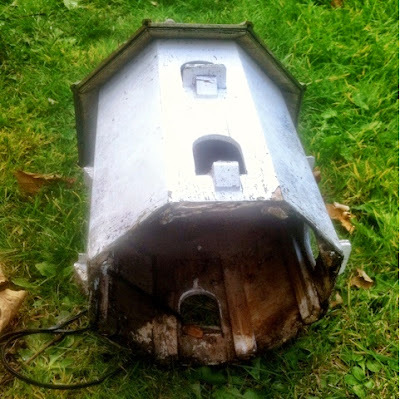 It's a dove house, but unfortunately the bottom fell out and it needs a bit of a paint-job and some work done to the roof. But I think it should be fixable - with some woodwork skills from MOH - and I have some plans for it, which I'll share when they come off! So that's my garden ornaments - what do you have in your garden?